Hello and welcome to the Superintendent's page. I am proud to serve as the Superintendent of this great district and have called L'Anse Creuse home for more than 20 years. L’Anse Creuse is more than a school district; we are the glue that connects several townships filled with diverse individuals. No matter our backgrounds, we all have one common thread: our students and their success. Whether you are retired with adult children, in the thick of raising school-aged children, or just getting ready to start a family, we all understand high-caliber schools translate into successful students and a bright future for our community. I hope you take the time to navigate through our website and learn of the amazing things happening in L'Anse Creuse and the first class educational opportunities we provide. Feel free to visit the Community Education page where we also offer many youth and adult enrichment programs such as swim, trips and tours, senior citizen programs, fitness, special interest classes, arts and crafts and much more. Please take a moment to enjoy the LCPS Spotlights section, the LCPS Pride Newsletters and the NEW Living L'Anse Creuse magazine provided below to hear about the wonderful stories of our students, staff and community. Thank you for being a part of the L'Anse Creuse Community! Hiring Bus Drivers L'Anse Creuse is now hiring bus drivers! Six hour minimum and paid training. If you are interested call (586) 783-6550 ext. 1113. You can also apply online here. Teacher Job Fair LCPS is looking to hire for multiple teaching positions. We will be hosting a Teacher Job Fair on May 7 at the Concorde Inn. Click here for more information. 50/50 Raffle Tickets for the L'Anse Creuse Foundation 50/50 Raffle tickets are on sale now! Click here to learn more. Community Education Registration Now Open Registration is now open for Spring/Summer 2019 Community Education programs. Click here to learn more and sign up. Free Preschool LCPS has openings for the School Readiness Program. Click here to view requirements. LCPS Pride Newsletters are filled with stories shared by L'Anse Creuse staff members throughout the district. Click on the newsletters below to hear what is happening across the district! Living L'Anse Creuse is a new publication designed to showcase the incredible students, staff and community of L'Anse Creuse Public Schools. 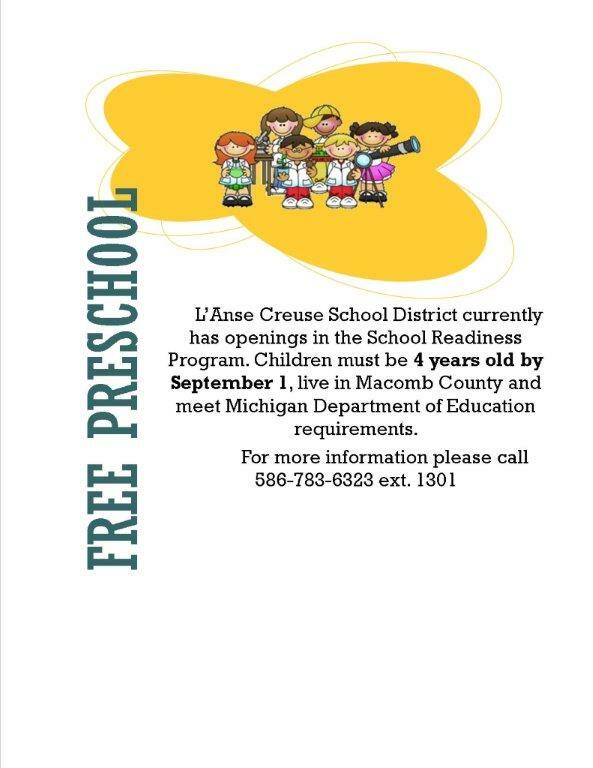 Please click on the picture for the summer edition of Living L'Anse Creuse !